New to Lean Six Sigma? If you're just beginning to learn about Lean Six Sigma, MoreSteam has many free resources to assist you. So how did it become Lean Six Sigma? And what is Design for Six Sigma? Six Sigma is a comprehensive and flexible system for achieving, sustaining and maximizing business success. Period. What makes Six Sigma different? Six Sigma is uniquely driven by a close understanding of customer needs, disciplined use of facts, data, and statistical analysis, and diligent attention to managing, improving, and reinventing business processes (from the book The Six Sigma Way by Pande, Neuman, and Cavanagh). The Six Sigma methodology is based on the concept that "process variation" (e.g., customer waiting times at a call center waiting varying between ten seconds and three minutes) can be reduced using statistical tools. The ideal goal is to fix a process so that it will be 99.9997% defect free or produce only 3.4 Defects per million opportunities or less! For example, this could mean 3-4 broken light bulbs in one million produced, or 3-4 customer calls with waiting times more than one minute. From a statistical standpoint, this means that a process centered at the target has six Standard Deviations (sigma) between the process mean (the target) and the nearest specification limit. Six Sigma projects are built on a DMAIC framework of five phases: Define, Measure, Analyze, Improve, Control. These phases each contain a set of tools and techniques that guide the problem solver through the improvement process from start to finish. Lean (also referred to as Lean Methods or Lean Speed) is a set of tools developed to reduce the waste associated with the flow of materials and information in a process from beginning to end. The goal of Lean is to identify and eliminate non-essential and non-value added steps in the business process in order to streamline production, improve quality and gain customer loyalty. Using more problem-solving techniques can help solve a larger number and variety of business problems. Starting in the 1980's, consultants trained in both techniques realized the synergy between Lean and Six Sigma and began to push for the combination of the different tools of Six Sigma (focused on improving quality) and Lean (focused on removing waste). Thus, Lean Six Sigma (LSS) was born. A combined management approach, LSS amplifies the strengths and minimizes the weaknesses of both approaches when used alone. Increasingly popular, Lean Six Sigma first emphasizes the use of Lean methodologies and tools to identify and remove waste and increase process velocity, then follows that with the use of Six Sigma methodologies and tools to identify and reduce or remove process variation. Most deployments (organizations that run quality initiatives within a company) now choose to use Lean Six Sigma rather than just one or the other methodology. A "Belt" signifies experience. Practitioners are given a "Belt" title (Black Belt, Green Belt, Yellow Belt) that corresponds to their level of experience. This roughly corresponds to their hierarchy in martial arts, with darker colored belts indicating more experience (more training, more knowledge and skills). For a visual example of what this looks like, visit our Belt comparison page. A Black Belt has expert knowledge and skills related to the DMAIC methodology, Lean methods, and team leadership. Black Belts should be able to lead any team across the organization in executing Lean Six Sigma projects. Black Belts may also conduct Lean Six Sigma training and act as coaches and mentors to other Belts-in-training. Black Belt training can be obtained from a variety of sources but is typically between 140 and 160 hours in duration and includes instruction in the use of statistical data analysis, designed experiments, team leadership, and project management. Black Belt Certification - the recognition of both knowledge and the practical application of skills - is offered by MoreSteam, the American Society for Quality (ASQ) and other organizations and consulting firms. A Green Belt has strong knowledge and skills related to the DMAIC methodology and Lean methods, but typically does not have experience with advanced statistical tools such as design of experiments (DOE). Green Belts may lead simple projects under the guidance of a Black Belt or may work as a team member on a large project team. Green Belt training can be obtained from a variety of sources, but is typically less than 100 hours in duration and includes instruction in the basic use of statistical data analysis, with emphasis on team problem-solving techniques. Green Belt Certification - the recognition of both knowledge and the practical application of skills - is offered by MoreSteam, the American Society for Quality (ASQ) and other organizations and consulting firms. A Yellow Belt is trained in the general Lean Six Sigma concepts and basic tools. A company deploying Lean Six Sigma may choose to designate project team members as Yellow Belts after completing a required training course, or may use the designation for employees responsible for data collection for a Green Belt or Black Belt project. The Yellow Belt body of knowledge is defined quite differently by different organizations. In some cases, it may represent only the most basic concepts and language of Six Sigma, with an overview of the DMAIC process. In other cases, Yellow Belts are trained in a more complete set of basic tools, typically representing 15 to 25 hours of training. A project Champion is a high-ranking manager who will work with a Black Belt to ensure that barriers to project success are removed and the project team has the organizational support it needs to be effective. A White Belt has received a small amount (several hours) of awareness training. Enough to be dangerous! Most White Belts are executives or staff who need to know the very basics of process improvement. White Belt training is used to assist change management and cultural buy-in from professionals who won't use the tools but may be impacted by projects. After all you've just read, be aware that organizations also refer to their systems as Process Improvement, Continuous Improvement, or Process Excellence. The tools and techniques are generally the same. For more definitions, visit SigmaPedia.com, the Lean Six Sigma Free Online Encyclopedia. And what is Design for Six Sigma (DFSS)? Lean Six Sigma tries to fix broken processes that already exist. But what if there were a way to create higher quality processes at the design stage? A variant of Six Sigma, Design For Six Sigma (DFSS) is a methodology used to design from scratch or re-design a product or process to one that meets customer requirements and has an expected quality level of Six Sigma. DFSS is about "getting it right the first time" instead of improving later (the focus of DMAIC Six Sigma). That's the point where the cost of change is lowest and the ease of implementation is the highest. 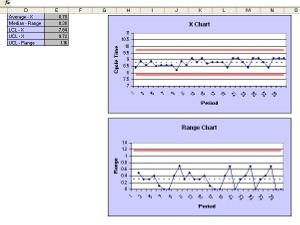 Design for Lean Six Sigma (DFLSS)? That's where Lean is added to the mix, so it's all the tools and techniques put together. A growing number of deployments are describing their efforts as DFLSS. The LSS methodology relies on an impressive number of tools and techniques, many of which (e.g., Fishbone Diagrams, Statistical Process Control Charts, 5S) have been collected from earlier quality methodologies. This makes LSS familiar to many quality practitioners and easy to learn. The DMAIC framework is used to organize the tools into the appropriate order for use in project work. LSS also relies on statistical tools and tests to better understand the trends in process metrics and data. In training, Six Sigma practitioners learn to calculate many of these statistics by hand or with a calculator, but in actual project work, they rely on tools such as EngineRoom® to help automate and simplify the statistics and provide statisticians and non-statisticians alike with data analysis tools and templates. The MoreSteam Lean Six Sigma Toolbox is a free series of short tutorials that covers a wide range of tools employed in a typical Lean Six Sigma project, including Flow Charts, Histograms, Fishbone Diagrams, and SPC Charts. Some tutorials also include downloadable Excel templates. MoreSteam's e-Learning classes include more extensive versions of these tutorials.